IXCACAO… Fruto de la tierra, para abrir el corazón, fruto de la tierra, pa´sanar el interior, esa es IXCACAO, medicina ancestral, esa es IXCACAO, te venimos a ofrendar… This ancestral and very sacred Plant Spirit, Theobroma Cacao keeps opening our hearts and helping us to see each others stuff , through the eyes of love. So blessed we are to have each other, to serve each other, to expand through each other. The gift of remembrance came through the Ceremonial Use of Cacao. We keep cultivating inner peace, understanding and compassion, without effort, allowing the light of existence to work through us, loving ourselves even more, and doing the best we can, to the extend of our abilities, without any expectation, to keep our hearts open, glowing to serve YOU ALL. IXCACAO is a light for us to see the smile within that makes us Glow. We polarize in order to catalyze, stabilizing energy. We seal the matrix of self generation, with the lunar tone of challenge, we are guided by the power of Magic. Being present as individuals and as a couple is the best gift we can ever give you. Thank you for being part of this flow/ co-creation. From Right to Left: Barbara & Keith Wilson, Nan Faviana Cochoy Alba & Tan Pedro Yac Noj. Sharing with our Family after our Last Fire Ceremony. 2018, Lake Atitlan, San Marcos, Guatemaya. TAT PEDRO YAC NOJ & NAN FAVIANA COCHOY ALBA, AJQ’IJ, GUARDIANES DEL TIEMPO Y LAS TRADICINES MAYA K´ICHE´, GUATEMAYA. “ Nuestros caminos se cruzaron hace ya algún tiempo. Los conocimos en Jerez, Zacatecas, México en la Kiva de Raices de la Tierra en el 2010. En el 2012 ofrecieron nuestra union espiritual y desde entonces nuestra historias se entrelazaron. Son nuestros maestros, les respetamos y estamos muy agradecidos por su presencia en nuestra vida. Honramos su caminar y la transmision que de ellos hemos recibido. Son trabajadores incansables y servidores comprometidos, son seres sabios y fuertes que con su caminar nos invitan a conectar con nuestra Gran Madre Tierra. Su disciplina, entrega y servicio hacia su pueblo y tradiciones ancestrales son admirables”. KEITH & BARBARA WILSON, HOLDERS OF THE CHANNELED CACAO CEREMONY FOR WESTERNERS. “La sincronía nos llevo a San Marcos con el Cacao Shaman, Keith Wilson en el 2012, al año siguiente conocimos a Barbara su esposa y compañera en este viaje con IxCacao. Fue amor puro y verdadero de inmediato hacia ellos y hacia su servicio planetario. En el pequeño porche de su humilde casita tuvimos nuestro primer encuentro con el Sagrado IxCacao. No buscábamos nada, no sabíamos nada… Y ahi empezamos este viaje bello y verdadero de regreso a nosotros mismos. Desde lo galactico llego la transmisión del mensaje del amor incondicional. IxCacao nos cambio la vida, desde entonces, nos acompaña todo el tiempo y San Marcos es el lugar por excelencia para un peregrinaje que nos lleva a lo mas profundo, luminoso y verdadero de nuestro ser. Son parte tambien de nuestra familia, son amigos, magos y grandes maestros en el arte de brillar en luz GLOW. Paola I´x, – Hija de Marta Victoria, Nieta de Marta & Emma, nacida y criada en Bogotá, Colombia. After her fathers transcendence in 1996 and a lower back cronic pain in 1999 …“my inner child calling for some attention” , Paola had no other choice than to stop and listen. A new door was opening for her. Yoga for her Body, Mindfulness for her Mind and Heart, always as a student and practitioner who later started sharing her experience and path with others. In Bogota, in 2006 she created The "Eterno Sol Yoga & Mindfulness" program, since then she shares the tools and practices of Yoga Asanas & Mindfulness Meditation that she has been practicing and teaching for the last years 18. She has developed programs for business, schools and communities, families and individuals, and she has trained hundreds of people around Latin America. Her intention is to lovingly and compassionately support and inspire others: parents, teachers, community leaders, children, teens; to shine their own light so they can inspire those around them to do the same. On 2010 synchronicity brought her to Mexico and Spirit arranged all for the meeting with Gustavo Ix. She moved to Mexico in 2011 and marry Gustavo a year after. Since then, the journey has become more clear, much more brighter and with a lot of Fun and Joy. Gustavo Ik- Hijo de Padres y Abuelos Mexicanos, nacido en Tepic, Nayarit, México. An active and committed practitioner and teacher of The Law of Time Teachings and the Synchronic order. 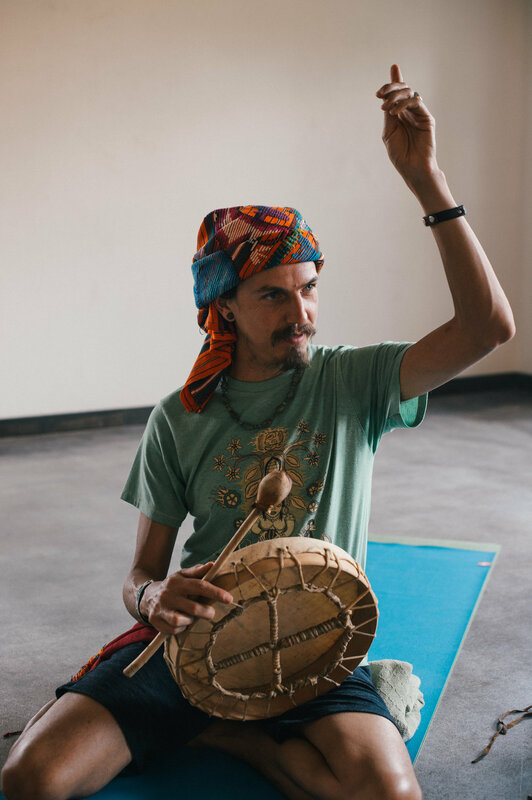 During the last 11 years he has been studying with native elders from North, Central and South America and practicing Yoga and Meditation. Gustavo communicates the Galactic and the Ancestral/Native to those willing to listen. Through his flute he speaks the sound of the wind and his voice shares stories about his path and personal healing. His eloquent, natural and unique way of being inspires and nurtures every heart. Since 2011 Gustavo and Paola walk together healing and remembering how it all goes back to the masculine and feminine within. 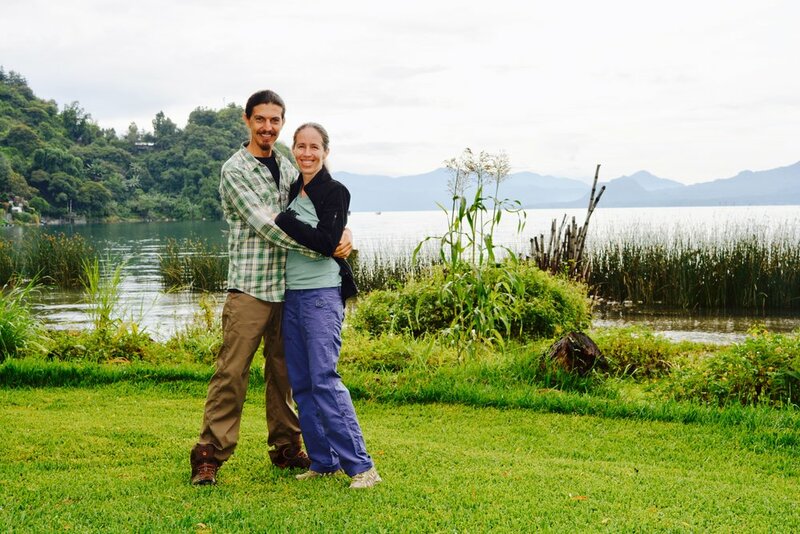 Paola and Gustavo share private retreats in their Home - Temple in Mexico. Ceremonial Cacao is part of their lives and their sharings. By LOVING US UNCONDITIONALLY , BEING IMPECCABLE and shining OUR INNER SUN …. “STAY GOLDEN and Go to GLOW” … we inspire others to SHINE EVEN MORE!